Any athlete who uses his/her legs: runners, swimmers, cyclists, triathletes, weightlifters, crossfitters, obstacle course racers, mma athletes, team sports athletes (football/basketball/baseball/soccer/volleyball/hockey), etc. Anyone who works on his/her feet all day, because gravity causes poor circulation in your legs when you are standing all day…. nurses, doctors, construction, and numerous other professions will benefit. Anyone who battles poor circulation would benefit: diabetes, varicose, peripheral artery disease, and just about any circulation disease with the exception of deep vein thrombosis (contraindicated). Anyone who enjoys a relaxing massage! You just need to try it to believe how relaxing it is! The pressurized compartments in the boots squeeze your legs, arms or hips, mobilizing fluids and speeding up your body’s natural process of filtering lactic acid, metabolites, and other debris that build up after exercise-induced trauma out of your blood. Improved removal of Lactic acid and lymphatic flushing, thus toxin removal. Reduces inflammation and water accumulation in legs and arms. 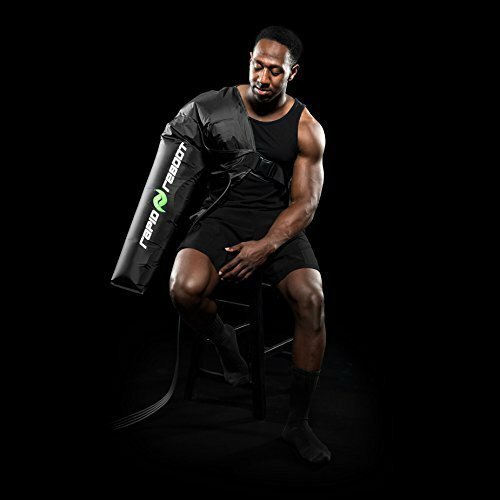 Accelerated recovery, so you feel rejuvenated and ready for the next workout. Dynamic EPC has demonstrated favorable effects on flexibility (16), muscle soreness (15), muscle swelling (1), and lymphedema. At least two main additional factors could play a role in the observed changes in muscle performance: increases in capillary contacts per fiber, and oxidative capacity. This is the first study to characterize the effect of IPC treatment on these two variables in a model of peripheral arterial insufficiency. We have shown for the first time that 2 wk of daily applications of intermittent pneumatic leg compressions produces significant improvements in exercise tolerance in a pre-clinical model of peripheral arterial insufficiency. This functional benefit appears to stem, at least in part, from improved blood flow to collateral-dependent tissues. These novel findings encourage additional efforts to determine the mechanistic basis behind the functional improvements associated with this novel therapeutic strategy. In summary, EPC is significantly more effective than a passive recovery condition for BLa clearance. Intermittent pneumatic compression (IPC) therapy is an effective modality to reduce the volume of the lymphedematous limbs alone or in conjunction with other modalities of therapy such as decongestive therapy. As pump technology has progressed, it has been accompanied by a body of research supporting medical applications of these devices both alone and in conjunction with other compression treatment modalities for optimal reduction and control of lymphedema. This review suggests there is a viable place for IPC devices to be utilized as an adjunct in effective management of lymphedema. Note: Lymphedema is a medical condition caused by a blockage in the lymphatic system which often results in the swelling of the arms or legs. The technology is normally used to promote blood flow and remove waste products from patients suffering from lymphedema and for athlete recovery. One such therapy that has been used for the reduction of swelling in the limbs is intermittent pneumatic compression (IPC). IPC, a mechanical squeezing of the limb, has been used effectively for treatment of swelling caused by lymphatic disorders or posttraumatic edema. Specifically, studies showed a significant reduction in swelling after IPC both in cases of acute ankle sprains and after cast removal subsequent to leg fractures. In addition to decreasing swelling, IPC treatments have produced increased range of motion of involved joints. Glycogen is a readily mobilized storage form of glucose. It is a very large, branched polymer of glucose residues that can be broken down to yield glucose molecules when energy is needed. Because recovery modalities typically target blood flow, they may theoretically alter glucose availability to muscle during recovery and therefore alter the process of glycogen synthesis. If muscle blood flow is altered by PCD (pneumatic compression device), then extraction of glucose from the blood may be changed, in which case, glycogen replenishment, and blood glucose and insulin may be affected.